Recently while scrolling through files for a photo I came across the above one. The photo was taken only 18 months ago but seems so much longer. It’s the kitchen of my previous job where I spent 14 years of my life. I remember the morning I took this photo. I was the first in the kitchen, which was not unusual, and my favorite time...to be alone in the large kitchen. When I opened the photo I was surprised at the emotions it stirred. It sort of stopped me in my tracks. When I resigned from my position some were surprised but it was not a rash decision on my part. And most, I think, believe that I simply left that job for my current one. But this couldn’t be farther from the truth. Yes, of course, I left one job for another, but the more accurate truth is that I left a chef’s position to take a cook’s position. And there is a difference. 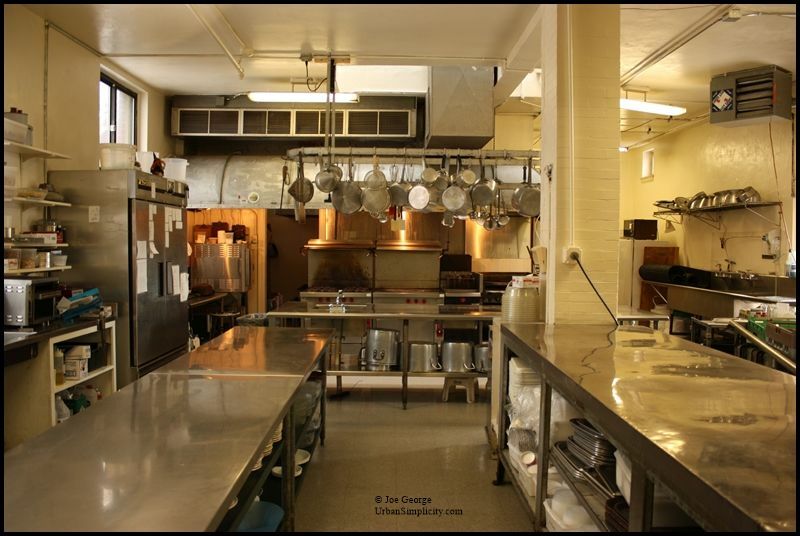 Many people refer to themselves and others as a chef simply because they work in a professional kitchen. And while this may be true in many instances in others it is not. The chef is the one in charge of all that happens in the kitchen. The word, chef, translates from the French as “boss” (literally, chief). Thus, if you work as a cook in a kitchen but are not in charge you are a cook. And there is nothing wrong with that. On the contrary, working as a cook is an incredibly important and honorable job. I in no way intend to sound self-righteous or to lecture, this is simply a fact. At 55 years young I first faced a stove 39 years ago. I was hired as cook at the ripe age of 16 and accepted my first chef’s position at 27. Thus I have been in charge of kitchens for the past 28 years. And again, I am not trying to sound self-important, the reason I mention this is that I never thought it would be so difficult, such a drastic change. This is what was stirred in me when I saw this photo. In my current position I work in the kitchen of a grocery store, albeit a fancy one, but nonetheless still a grocery store. In my current role I am low-level management (very low) and my title is not as cook or chef, it is “coordinator.” Though I still spend a large portion of my day cooking. As aforementioned, making this job change was not a rash one, and I am in fact glad to have done it. I thought about it and I prayed about it for months prior. I needed the change for too many reasons to mention here. I consciously chose a job where I would not be the one in charge (downwardly mobile, to quote Henri Nouwen). This has enabled me to do things that I had intended by making this/these change(s). I have pursued my photography successfully, and I am back in school working towards finishing a degree (which after two prior attempts was unable to do in the past because of working “chef hours”). But the biggest benefit of this change is that I am a lot less stressed. So now I have many layers of management above me. Some of my current bosses are young enough to be my children. But that’s not the part that is really difficult. The part that I struggle with the most, I think, is that I am not in charge...but the irony is that I don’t want to be in charge. After so many years being the chef, it is part of me. This is something I am still coming to terms with. And this is also something that was stirred in me when I saw this photo. Now as the year ends and a new one is about to begin I look backwards in remembrance but also forward with hope and anticipation. But mostly I am trying to stay in the present and take each day—and each moment—as they come. While I have no financial stash to speak of (no, seriously) I am wealthy in so many other ways. I have been fortunate enough to have done and accomplished so much and am truly grateful. Life is a journey. It’s not always an easy one, but it is—I believe—one lesson after another. I can only imagine where the rest of the journey will lead, thank you for being part of it. I know exactly how you feel. I was a big fish in a big pond for many years. Then in 2003 at the age of 52 I left that pond and moved to a much smaller pond where I have deliberately maintained my anonymity. The freedom I enjoy by downsizing my life was and is exhilarating. I've never regretted the change. Life was meant to be lived.